Bristol Recording Studios: A Cappella Armageddon!! FINAL BATTLE RESULTS - CONCERT Held Dec 4 at The Middle East! Visit often to see more postings of photos, videos and merchandise! Order by Monday Dec. 19th to receive in time for Christmas! LIMITED EDITION A Cappella Armageddon 2011 T-Shirts Available Now!! 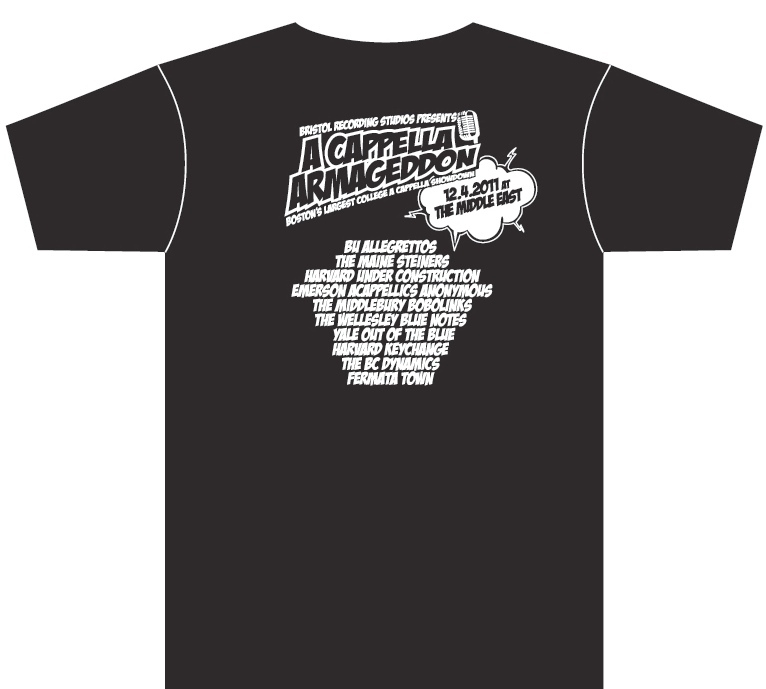 Wear your A Cappella Armageddon t-shirt proudly! Yes! You were there! This is a LIMITED EDITION run and will be available only while supplies last. Get yours now! You can order black 100% cotton pre-shrunk cotton shirts in S, M, L, XL. Place your order now and you can either pick up your shirt at Bristol Recording Studios OR arrange for shipping (shipping fees extra). Big Thanks to all of the Finalists who performed at the Final Battle. Bristol Recording Studios, New England's premier recording studio, with 25 years experience working with a cappella groups, presents A Cappella Armageddon, New England's newest a cappella competition! The first annual A Cappella Armageddon incorporates the best of LIVE a cappella performances and the thrill of cutthroat competition to reward one group with national recognition and some amazing prizes! It seemed like a good time to bring a fresh, alternative approach to the arena of a cappella competition, so the team at Bristol Studios created A Cappella Armageddon! Every group that registers will get their chance to prove themselves in a live performance preliminary round held at Bristol Recording Studios in Boston in front of a judging panel of vocal and a cappella professionals and a cappella fans. Groups can also have their fans vote online to bolster their chances of winning! "We've worked with so many a cappella groups over the years and we seem to work with more every year, we wanted to give back to the a cappella community. This also offers an opportunity for groups to win a substantial amount of recording time doing something that they love," says Jason Blaske, studio manager of Bristol Recording Studios. "We're really excited about this competition. It provides provides a fresh alternative to the many great a cappella competitions out there and it's really cool that we're able to host the Final Showdown at the Middle East, which is such a historic rock club." 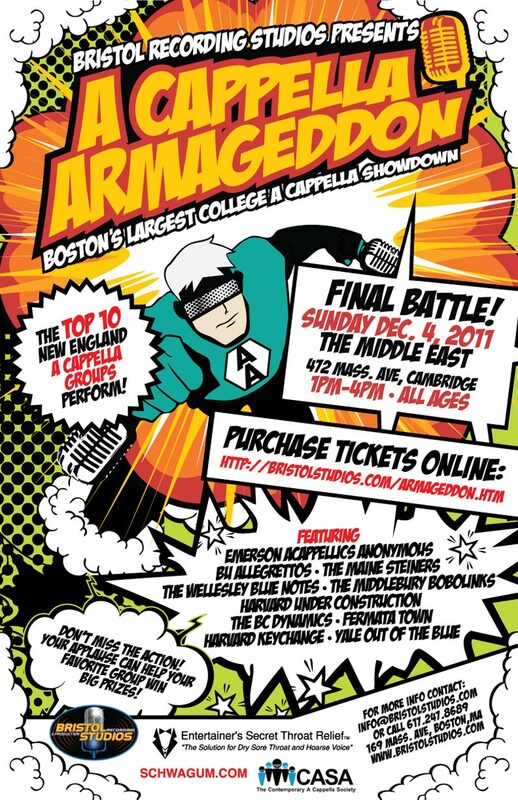 "A Cappella Armageddon is the newest collegiate competition offering Boston area a cappella groups a great opportunity to perform and compete for some fantastic prizes!," says Amy Malkoff of CASA (Contemporary A Cappella Society of America), "Good luck to all the groups!." If you think your group has what it takes to battle with the best and want a shot at some amazing prizes, read on and find out more below. We look forward to seeing you in the A Cappella Armageddon arena! The fee is $20 per group. Registration is online at BristolStudios.com/armageddon.htm (top of this page). Groups will be contacted after they register about scheduling a live performance in the Preliminary Round at Bristol Recording Studios, 169 Massachusetts Avenue, Boston, on November 4, 5 or 6th, 2011. You may also submit an audition video via YouTube. Eight groups will be chosen as winners of the Preliminary Round and will progress into the Final Showdown. Each group will be contacted and invited to perform at the Final Showdown on December 4, 2011 at the Middle East Nightclub (Downstairs), Cambridge, MA. If your group is selected as one of the top eight, this is your time to gather your fans and prepare for the Final Showdown, as crowd response counts for 25% of the judging! Tickets to the Final Showdown are $10 in advance or $15 at the door. The show is all ages. All performers will have free entry to the show. The Final Showdown will be held at the Middle East Nightclub (Downstairs) 470-480 Massachusetts Ave, Cambridge on December 4, 2011. The eight winning groups from the preliminary round will have 15 minutes of performance time to wow the judges and the crowd. First, second, and third place winners will be chosen and announced on the spot. The Final Showdown will feature industry judges, including a representative of CASA (Contemporary A Cappella Society). Custom designed T-Shirt Prize Package! 1. Entrance Fee is Non-Refundable. 2. Employees of A Cappella Armageddon & Bristol Recording Studios, their families, subsidiaries, and affiliates are not eligible. 3. Prizes will be awarded jointly to all members of any winning group; division of prizes is responsibility of winners. Void where prohibited. All federal, state, and local laws and regulations apply. 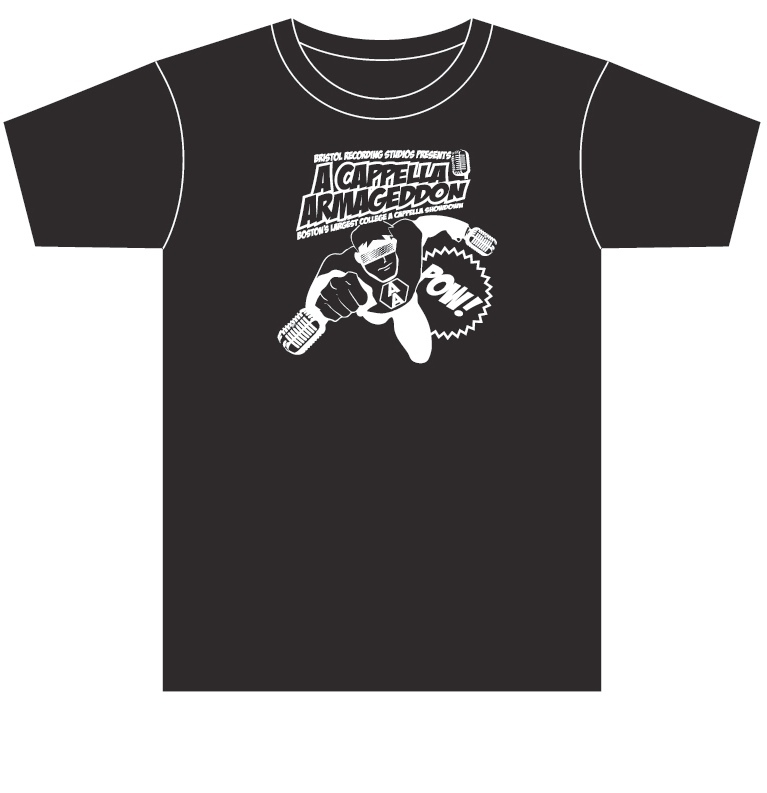 A Cappella Armageddon reserves the right to substitute prizes of equal or greater value. 4. Entry constitutes permission to use winner's names, likenesses, and voices for future advertising and publicity purposes without additional compensation. 5. Winner Announcements: Preliminary Round winners announced on or prior to November 11, 2011 . Final showdown winners announced on December 4, 2011. A Cappella Armageddon reserves the right to extend these deadlines for any reason. Announcements will be sent to the email address provided by each entrant and will also be posted on www.bristolstudios.com. Get: 1. Free Web Promotion Tips from veteran Producer Ric Poulin 2. A comprehensive Boston area Karaoke/Open Mic listing 3. A Music Resource Guide including helpful music industry articles and a complete Directory of major music conferences, music organizations and copyright information resources!